If the General Theological Seminary is the soul of Chelsea, Chelsea Market is its heart and stomach. 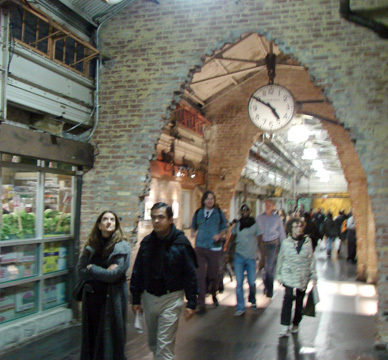 Chelsea Market is a complex of 22 buildings that occupy the blocks bounded by Ninth and 11th Avenues and 15th and 16th Streets. The complex originally was owned by the National Biscuit Company (Nabisco) and some of its predecessor companies and that culinary heritage, dating back to the 1890s, has been preserved. 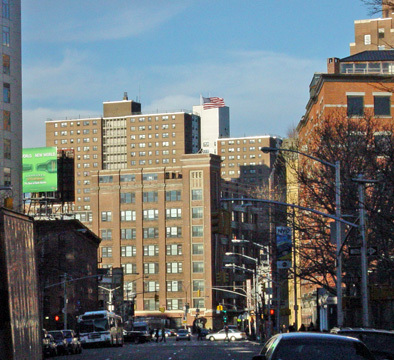 In the 1990's, the investor Irwin B. Cohen organized a syndicate to buy the principal National Biscuit buildings, from Ninth to 11th Avenue and 15th to 16th Street. He rented the upper floors to such companies as Oxygen Network, Food Network, MLB.com and the local New York City cable station NY1. On the ground floor, however, his designers, Vandeberg Architects, created a long interior arcade of food stores, probably the best shopping experience in New York City, full of surprises and memorable smells. 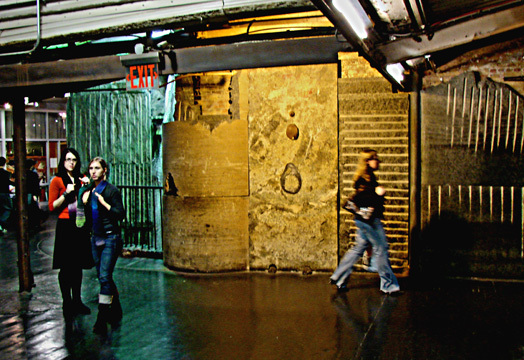 The building's website correctly states that "To walk through the Chelsea Market is to stroll through a sort of postindustrial theme park, carefully festooned with the detritus of a lost industrial culture, interspersed with food stores and restaurants." "After completion of the interior concourse with its new entry at mid-block on 9th Avenue, it became apparent that shoppers had difficulty finding this location. The ownership also wanted to reflect the great interior changes on the exterior. To herald this major change, the entire existing facade was refurbished and repointed and unified with the introduction of patina’d brass ribbons covering the brick spandrels, which appear to weave behind and in front of the building pilasters. A new folded stainless steel and green glass canopy was developed to reinforce the building’s presence in the Market district. It rises above the Market’s entrance with its granite medallion and is joined on the south end by a matching folded steel and acrylic vertical sign which is indirectly illuminated. 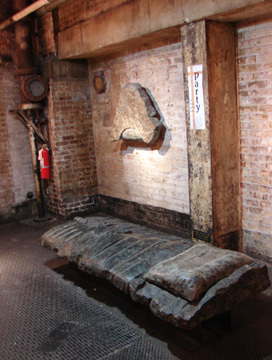 At street level all brick piers are covered with large slabs of eau sable granite, sculpted by Mark Menin, continuing the granite found throughout the Market’s interior. 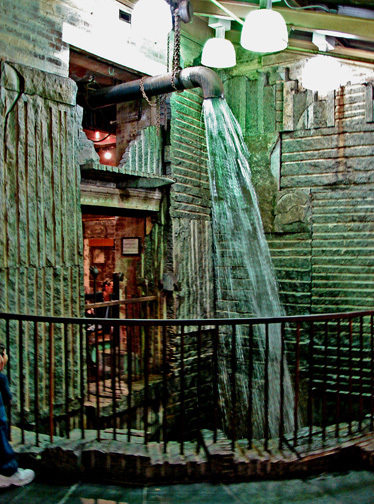 Central ‘industrial’ fountain made with large raw slabs of AuSable granite and discarded drill bits by sculptor Mark Menin.The brick arch in the concourse running through the building. A connecting passage through the old block house that controlled the former factory’s train shed was created by cutting two self supporting catenary arches through its solid brick walls." According to the Vandeberg Architects' website, Jeff Vandeberg "emigrated from the Netherlands to Nebraska as a teenager in 1950. He earned a Bachelor of Architecture from the University of Nebraska and subsequently pursued graduate studies at the University of Michigan where he apprenticed with sculptor Joseph Goto. In 1963 he was invited to join the New York firm of Marcel Breuer and Associates where he collaborated on the Whitney Museum , IBM offices in Le Gaude, and the HUD building in DC. In 1967 Mr Vandeberg spent a year traveling extensively in Europe and the Middle East . Upon his return he joined the firm of Ira Kessler and Associates as head designer prior to striking out on his own in 1972. The early years of independent practice were spent as a design consultant for east coast architecture and engineering firms, among them Providence College Hockey Rink, Roanoke Electric Steel and the offices of the Mellon Foundation. 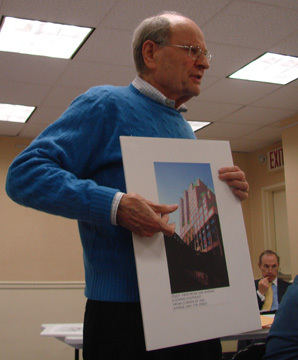 In 1974 he took space in the Flatiron building and began work with Irwin Cohen on converting Philadelphia’s largest bulk building, 401 North Broad St with tenants such as Sun Systems, Que Magazine and AmTrak. This led to other large conversions with Cohen in Long Island City , among them the Ford motor building and the Gimbels and Macy’s warehouses. During this period there was also active involvement in residential and commercial projects. From 1983 to 1985 Mr. Vandeberg taught as adjunct professor at Pratt Institute, following this sabbatical he returned to private practice, initiating a partnership that was dissolved in 1993. Recapturing a relationship with developer Irwin Cohen led to the conversion of a two block parcel of the former Nabisco factory and transformed it into the present day Chelsea Market." The retail space was completed in April 1997 when the original back lots of the individual buildings were connected to a central, ground-level concourse with entries at Ninth and Tenth Avenues. Retail tenants include the Manhattan Fruit Market, 202 by Nicole Farhi, Amy's Bread, Eleni's Bakery, Frank's Meat, Chelsea Thai, Fat Witch Barkery, The Lobster Place and a restaurant, called Buddakan. In January 2006 on the 10th Avenue side, Morimoto, owned by Food Network "Iron Chef" Masaharu Morimoto and designed by Japanese architect Tadao Ando opened. Opposite Morimoto across 10th Avenue, also in the Chelsea Market complex is Del Posto, an Italian restaurant owned by fellow "Iron Chef", Mario Batali. The Food Network films its very popular shows Iron Chef America and Emeril Live in the Chelsea Market. The High Line elevated park passes through the building on the Tenth Avenue side. "In 1890, eight large eastern bakeries amalgamated to form the New York Biscuit Company and soon absorbed a dozen more firms. It was competing against another consortium, the American Biscuit and Manufacturing Company in Chicago. The New York Biscuit Company immediately began building a Romanesque-style complex of six-story bakeries on the east side of 10th Avenue, running from 15th to 16th Street, designed by Romeyn & Stever - some of these survive at midblock. The rivalry was potentially ruinous, and in 1898 the two groups, along with others, combined to form the National Biscuit Company, which soon provided half the biscuit production in the United States. In late 1898, the new company brought out a new product, the Uneeda Biscuit, and it followed with many biscuits and cookies that are still familiar: Premium Saltines, Vanilla Wafers, Fig Newtons, Barnum's Animal Crackers (now Barnum's Animals) and, in 1913, both the Oreo (originally Oreo Biscuit) and the Mallomar. The company was painstaking about consistency, shelf life and packaging, and used extensive advertising to establish a national market. 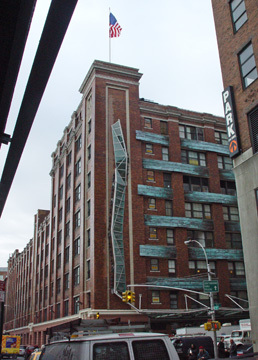 Within a few years of the merger, the bakery complex covered most of the block back to Ninth Avenue, with elements like the series of orange brick structures at the northwest corner of 15th and Ninth. Designed by the staff architect for the company, Albert G. Zimmerman, these slightly classical structures were built over the period 1905-12. In 1913, Zimmerman designed the most prominent building in the complex, the 11-story full-block structure from 10th to 11th Avenue and 15th to 16th Street. It was built on landfill - the timbers, chain and anchor of a two-masted schooner were found during excavation. 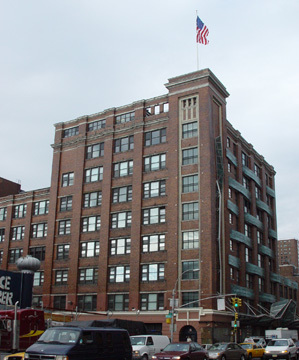 National Biscuit also acquired outlying property, like the old American Can Company building at 447 West 14th Street. That structure extends through to the south side of 15th Street, and National Biscuit erected a pedestrian bridge to join it with the main complex on the north side of 15th Street. Designed by a later company architect, James Torrance, it has a somewhat classical character and looks to be made of lead-coated copper. The company filed plans in 1926 for what would have been the centerpiece of its empire, a $3 million, 16-story bakery on the full block from 14th to 15th Street and 10th to 11th Avenue, but that project did not go ahead. In 1932, the architect Louis Wirsching Jr. replaced some of the 1890 bakeries on the east side of 10th Avenue with the present unusual structure, which accommodates an elevated freight railroad viaduct. Its great open porch on the second and third floors was taken by the railroad as an easement for the rail tracks that still run through it. Wirsching, by that time the staff architect for National Biscuit, presumably also designed the faceted, aluminum-covered Art Deco pedestrian bridge connecting the two National Biscuit buildings facing each other across 10th Avenue. In the 1930's, a new generation of ovens - long, continuous "band ovens" - were remaking the baking industry, superseding the old vertical ovens. According to William Cahn's company history, "Out of the Cracker Barrel: The Nabisco Story from Animal Crackers to Zuzus" (Simon & Schuster, 1969) National Biscuit installed some band ovens in the existing complex, but long horizontal industrial processes adapted better to the low single-story buildings that were going up in outlying areas. By 1958, National Biscuit was producing its line from a plant in Fair Lawn, N.J., and in 1959 it sold its New York complex - 22 structures, with 2 million square feet - to the investor Louis J. Glickman." The concourse has marvelous sculpted seats, lots of ducts,old floors and floors and a waterfall. 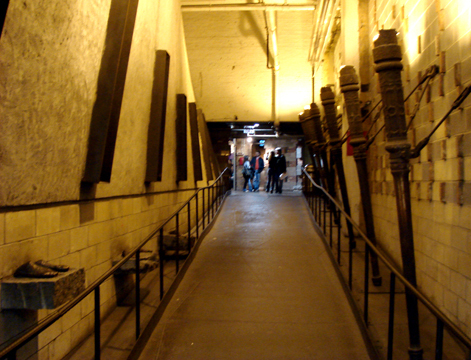 The building's interior looks like one of the city's best preserved archaeological sites. 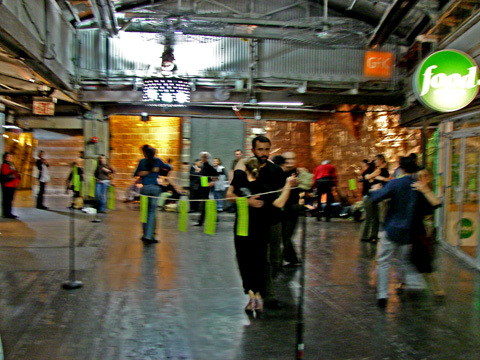 Jamestown Properties presented its plans to add 300,00 square feet of commercial space to its Chelsea Market complex in Chelsea at a Preservation and Planning Committee meeting in March, 2011 of Community Board 4. Most of the proposed new space, about 250,000 square feet, would be stacked atop the western end of the full-block retail and office complex between Ninth and Tenth Avenues and 15th and 16th Streets. The remainder will rise above its low-rise building on the southwest corner of Ninth Avenue and 16th Street. The planned additions require a zoning waiver. "The zoning change would bring the Market into a special district that allows extra floor area in return for $50 per square foot paid into a City-managed High Line improvement fund to meet the Park's long-term capital needs," observed the ArchiTakes website. An article by Joey Arak at ny.curbed.com noted that under the waiver "the developer would be paying $50 for every square foot of added space - over $16 million -into the High Line Improvement Fund, and would build a High Line amenities package that includes public restrooms and a new space used for events and education. Friends of the High Line co-founder Joshua David made an appearance to talk about how much the park would benefit from the added revenue." 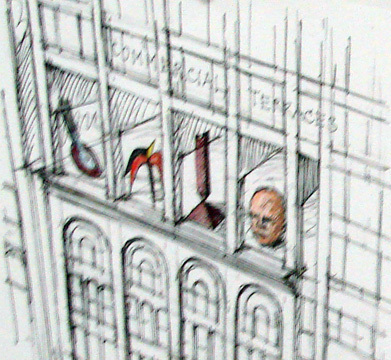 "Swimming in gold coins Scrooge McDuck style after selling a building [111 Eighth Avenue] to Google for $1.9 billion in cold hard cash," the article said, Jamestown showed renderings by Studios Architecture that indicated that the additions would be mostly red-brick and boxy with some indentations. "In a view looking north from the Hudson River Park bike path, and lined up behind other High Line straddlers, 450 West 14th Street and the Standard Hotel," the ArchiTakes article said, "the proposed Chelsea Market tower begins to summon the urban planning object lesson of Midtown's soulless slabs marching up Sixth Avenue. Midtownization seemed to be on the minds of several audience members; it was repeatedly asked just what the project offered a contentedly residential neighborhood aside from 250,000 square feet of un-asked-for Class A office space, above the High Line on Tenth Avenue, and an extraneous 90,000 square foot hotel on Ninth, across the Avenue from both the Maritime and Dream Hotels, and a few blocks north of the Gansevoort and Standard Hotels. Community Board members called the project...profit-driven rather than community-minded." The preliminary plans unveiled "were severely scrutinized by community members, leaving some worried that Chelsea residents would receive no community benefit from the mammoth project," according to an article by Elizabeth Ladzinski yesterday at DNAinfo.com. "I find nothing being offered to the community in this process, and that worries me," said Walter Mankoff, a member of CB4, whose sentiment was mirrored by attendees at the crowded meeting, the article said. 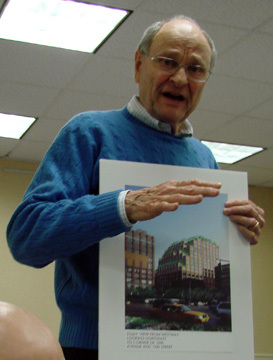 "I think the building you're putting on top of Chelsea Market is ugly," said Robert Trentlyon, a member of CB4, whose sentiment was applauded by many in attendance, the article continued, adding that "the hotel building overlooking Ninth Avenue, above Buddakan restaurant, would cater to business travelers and include a rooftop dining experience." Earlier this year, Jamestown cut a deal to pay more than $225 million to buy out its partners in Chelsea Market, a property whose redevelopment as a specialty-food destination and media mecca played a major role in the meatpacking district's renaissance. The complex was once owned by the National Biscuit Company, which sold its complex in 1959 to Louis Glickman. In the 1990's, the investor Irwin B. Cohen organized a syndicate to buy the principal National Biscuit buildings and he and his designers, Vandeberg Architects, created a long interior arcade of food stores, now a well-known destination in west Chelsea.